Eat This Not That is a diet book written by the editors of Men’s Health. The book does not involve a diet as such but instead provides dieters with the tools necessary to determine the calories in foods. The authors promise dieters that they will lose weight if they make better food choices. They state that they chose calories as the most important factor in selecting foods because excess calories are the major cause of excess weight and a variety of health problems. The book includes color photos with ‘eat this’ foods on one side of the page and ‘not that’ foods on the other side. Standard supermarket items and junk food are examined so that dieters are able to discern between two items that may appear very similar but differ greatly in their calorie content. As an example, when eating at Taco Bell the book recommends selecting two grilled steak soft tacos fresco style which contains 320 calories, rather than the Zesty Chicken Border Bowl which contains 640 calories. The authors rate fast food restaurants from A plus to D minus according to the nutritional quality of their menus. They also highlight the 20 worst foods that are the highest in calories, fat, and sodium. Throughout the book are many illustrations of the extremely high calorie content of certain foods. Examples are Outback’s Aussie cheese fries that pack in 2900 per serve and Lone Star’s 20 ounce T-bone steak that weighs in at 1540 calories. In addition to focusing on the worst foods the authors also identify eight superfoods that they recommend you incorporate into your diet as much as possible. Aside from these recommendations dieters are left to determine their own food choices and there is no specific plan or dietary guidelines to follow. The eight superfoods are blueberries, black beans, spinach, yogurt, tomato, carrot, oats, and walnuts. There are no recommendations for exercise in the book with the exception of advice for what to eat to get ‘the most out of your workout’. Try these exercises with Eat this, Not That. Eat This, Not That retails at $19.95. Increases awareness of the calories in foods. 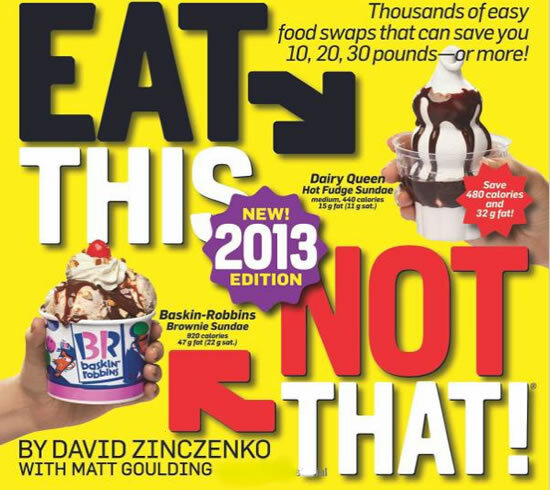 Easy to understand with ‘eat this’ foods on the left side of pages and ‘not that’ foods on the right side. Especially beneficial for dieters who eat out a lot and frequent fast food restaurants. Size of book makes it convenient to carry when grocery shopping or eating out. Menu decoder section makes it easy to select the healthiest items when eating at restaurants. Will not appeal to dieters who prefer to follow a specific meal plan. Won’t necessarily lead to weight loss unless dieters also watch their total calorie intake. Some of the ‘eat this’ foods are still very high in calories and not very nutritious. Some of the ‘not that’ foods are actually nutritious healthy choices. There are some contradictions with certain foods being listed as good at times and bad at others. Makes some unscientific and misleading claims such as that the program will specifically target belly fat and build lean muscle. The authors do not have any nutrition credentials. Dieters hoping to lose weight following the guidelines in this book may not experience the results they desire. The book does not offer a clear dieting guidelines and gives no recommendations for exercise. This book will be most beneficial for those who eat out a lot as it offers a simple way to help dieters to make lower calorie choices however not all of the recommended foods can be regarded as nutritious. It is important to remember that even though one food may be preferable to another this does not necessarily mean that it is a healthy choice. This is misinformation. Given moderate exercize, the latter choice (in this mans book) is much better for you nutritionally. If you follow this guys book, you are eating mostly empty calories & not getting much of the nutrirtional value to your food….People need to juat stop looking for some easy diet fix & use common sense (eat food that has meets our nutritional requirements & get some exercise!!!!!! ).